5 Bedroom Detached House For Sale in Helensburgh for Offers Over £595,000. 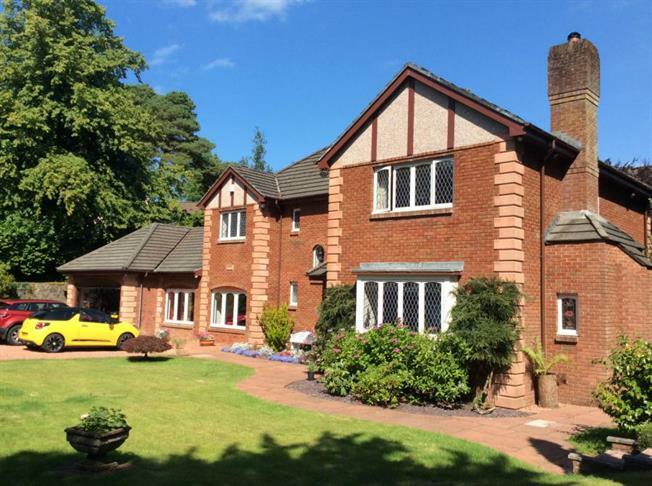 This splendid 5 bedroom secluded detached home is set within approximately half an acre of mature gardens and offers spacious accommodation over two levels which is presented to a high standard throughout. Accommodation comprises: Entrance vestibule; Reception hall; WC/cloaks Room; Spacious lounge with inglenook fireplace with wood burning stove and views to the front, double doors to dining room; Dining room with sliding patio doors to rear garden; Fantastic breakfasting kitchen with integrated oven, microwave, hob, extractor hood and dishwasher, breakfasting area with feature window to rear; Utility room with integrated freezer, space and plumbing for washing machine & tumble dryer, door to rear garden; Superb sized family room; Leisure room with infra red "sauna-style" cabin, gym area and access to garage; WC compartment. The upper floor is accessed via a staircase to a gallery-style hallway, with storage cupboard, which provides access to bedrooms and family bathroom; Master bedroom with dressing area and three piece en-suite shower room; Further double bedroom with in-built wardrobes and a three piece en-suite shower room; Two further double bedrooms both with in-built wardrobes; Home office which could be utilised as a 5th double bedroom; Three piece bathroom with Jacuzzi bath. The subjects are enhanced by double glazing, gas fired central heating system and an integrated double garage. A stone chipped and tree-lined driveway leads to the front of the property where there is ample parking for several cars and access to the double garage. To the front is an area of lawn, with gazebo, which leads down to a meandering pathway through woodland where a small waterfall and burn flows through the bottom of the garden. The rear garden is well laid out with paved patio area, lawn, fruit trees and flower/shrub/vegetable beds. The large timber shed and large modern greenhouse are both included in the sale price.